Inchcape UK’s Lexus Guildford and Surrey Hills Enterprises are delighted to announce their new corporate partnership which was officially launched on Tuesday 22nd January. 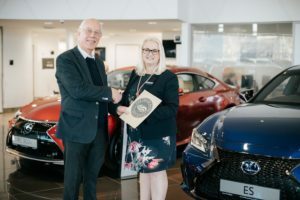 The luxury car retailer and community interest company have joined together to drive the next phase of a development which aims to build a thriving rural business community and develop Surrey Hills into one of the top 10 nationally recognised countryside destinations and brands in the UK. The partnership will also help to promote the ‘Trade Mark Surrey Hills’, recently launched with the support of the Rt Hon Michael Gove, Secretary of State for the Environment, Food & Rural Affairs. It is a mark of local provenance and quality which celebrates those businesses of high quality that reflect and support the distinct and special nature of the Surrey Hills and who share the values of supporting the local environment. Surrey Hills Enterprises is the commercial arm of the Surrey Hills Area of Outstanding Natural Beauty (AONB) which was established in 2012 to support and develop the rural economy and to promote, protect and enhance Surrey Hills.